To the west of Changshou Lu are two more major sites for decorative homeware and jewellery. 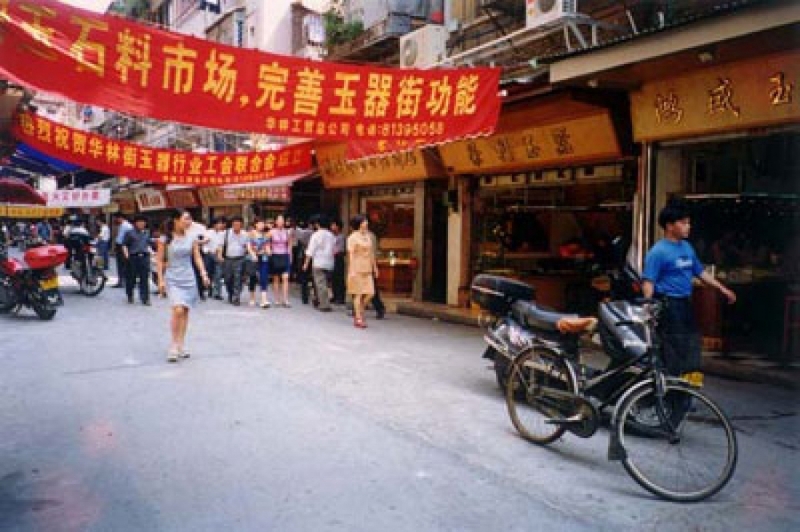 The Hualin Jade Street (华林玉器街), near the Hualin Temple, and neighbouring Yuansheng Xijie Street（源胜西街) feel more like bazaars than the “street” in their names suggests. Find jade and other semi-precious stone curios, jewellery, beads, antique and bronze collectibles, ceramics, brassware and carvings. Wise shoppers will double-check authenticity of any 'antiques' and bargain shrewdly. Address: Take metro Line 1 to Changshou Lu Station (长寿路站). Follow Changshou Xi Lu (长寿西路) to Wenchang Nan Lu (文昌南路), turn right and look for Hualin Lu (华林路) on the left. The handicrafts market area extends south to the intersection with Xiajiu Lu (下九路) and west to Kangwang Lu (康王路).